②Please introduce yourselves. Let's go clockwise from you. A: How do I get to Harajuku from Shinagawa? 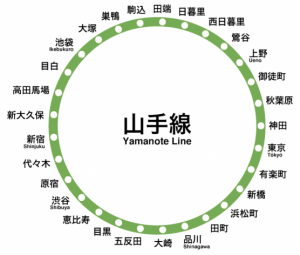 B: Take the Yamanote Loop-line. But you should take the clockwise-track. A: How do I know it? B: Ah･･･Take a train bound for Shinjuku-direction. A: OK. I think I should ask somebody on the platform.